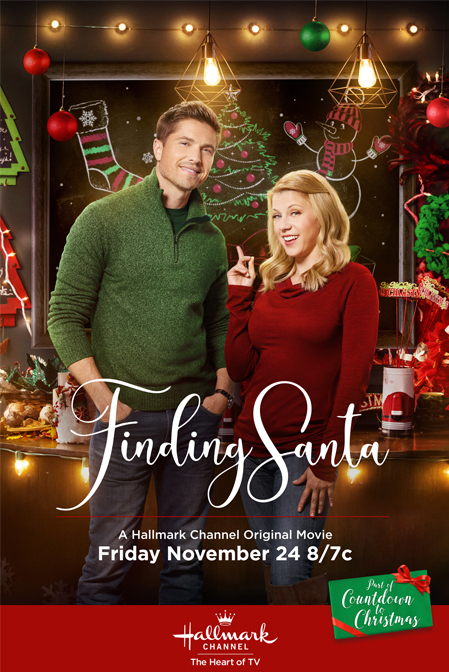 We’re a couple weeks into Hallmark’s Christmas blitz, and I’ve had the chance to catch some good movies, quite a few boring ones, and some just so-so ones. But Finding Santa is the first hilariously bad one, and I kind of love it. I mean, it’s a terrible movie. Mawkish and sloppy, it plays right into stereotypes about schmaltzy Hallmark fare. I also know I’ve just wasted an hour and a half of my life that I’ll have to answer for when I die. But the deed is done, and there’s nothing to do but to admit that there are some satisfying and squeamish chuckles, and to discourage anyone from ever watching this again. Let’s start with the story, which isn’t great but dumb plots have never stopped Hallmark before. It’s the week before Christmas, and the tiny town of Green River, Connecticut, prepares its 50th annual Christmas parade. The tradition is a major cultural and financial draw and is Grace’s (Jodie Sweetin) pet project. As owner of her family Christmas themed store and the grandchild of the parade’s founders, she is eager to make this a memorable and festive event, something that is sure to happen after a major network decides to broadcast it nationwide. Perfect. Except their beloved Santa takes a massive slow-mo spill, and suddenly, the parade becomes Grace’s biggest headache. You cannot find a Santa on such short notice! Tom (Jay Brazeau), the decommissioned St. Nick, runs his own Santa school, but all his acolytes are booked. Grace decide to recruit Tom’s son, Ben (Eric Winters), figuring he should know a thing or two about being jolly. But when she meets him, all he has to say is, “I’m not a Santa; I’m a writer.” No, you’re not if the book you’re writing is The Outsiders meets zombies. In truth, Grace and Tom have issues to work out. Both feel the pressure of carrying on family legacies and struggle to reconcile duty with their own passions. Fine, that is all good and noble, but does the story need to be powered by cheese? Every time Ben tries to resist or run away, something or someone magically nudges him back towards the Santa suit. Maybe it’s an ugly Christmas sweater or a crying kid, but beautiful Eric Winter, I mean Ben White, cannot remain closed off to the spirit of the season. Grace has the opposite problem. The more she is surrounded by jingle bells and twinkling lights, the emptier she feels. Girl just wants to grab a brush and some paint and not dismiss her artwork as a hobby. Self-discovery only works when it’s expressed organically though. In this movie, it’s all over the map, as in the two literally make a random stop at someone’s house when they are stranded in a snow storm. It’s during this time that Ben thinks maybe he should take up the role of Santa, before waffling and backing out again, and then hinting at maybe doing it. His decision-making follows no clear line, and I can’t tell if he’s just can’t bad at it or if the part is just poorly written. Winter must not care though because pretty boy pours his heart into this. He shares an emotional scene with Santa dad, which would have much more effective if their conflict hadn’t been so vaguely defined until that point. For forced emotion though, look no further than the leading couple. Sweetin and Winter have absolutely no chemistry. Zero. Ze-ro. She seems to be channeling Stephanie Tanner from Full House, which might not be fair except the actress’s limited range is on full display and all I can see is Stephanie Tanner. That doesn’t make for a romantic pairing or even a believable friendship, though it does make for some awkward comedy. The two barely connect, and simply saying the right words or untangling your Christmas sweaters does not count. Early in the movie, Ben rebuffs Grace’s plea to step in as Santa, saying they weren’t even friends in high school. He was a senior and she was a freshman, and that’s pretty much the dynamic that you get onscreen.